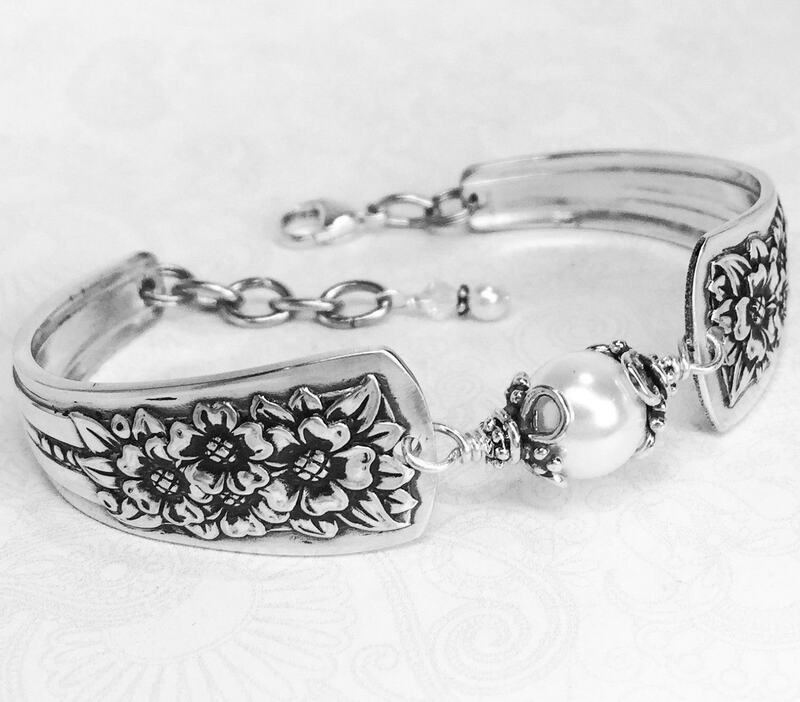 This elaborately detailed vintage spoon bracelet was created from two tablespoons. The pattern is the beloved 'Silver Belle' from 1940, making these spoons about 76 years old. 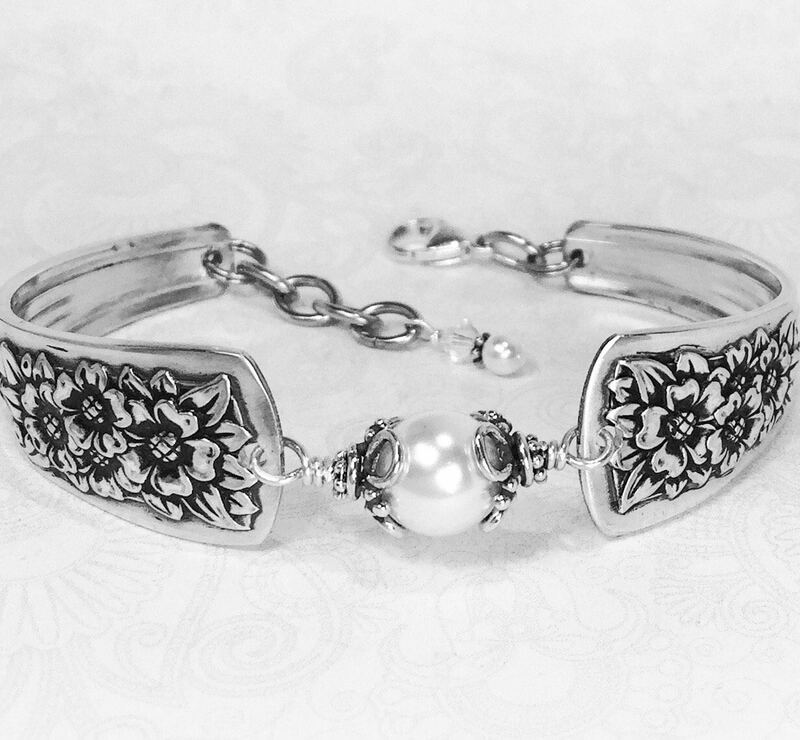 The tablespoons make this bracelet a real eye-catcher; without sacrificing comfort. Not too heavy at all. 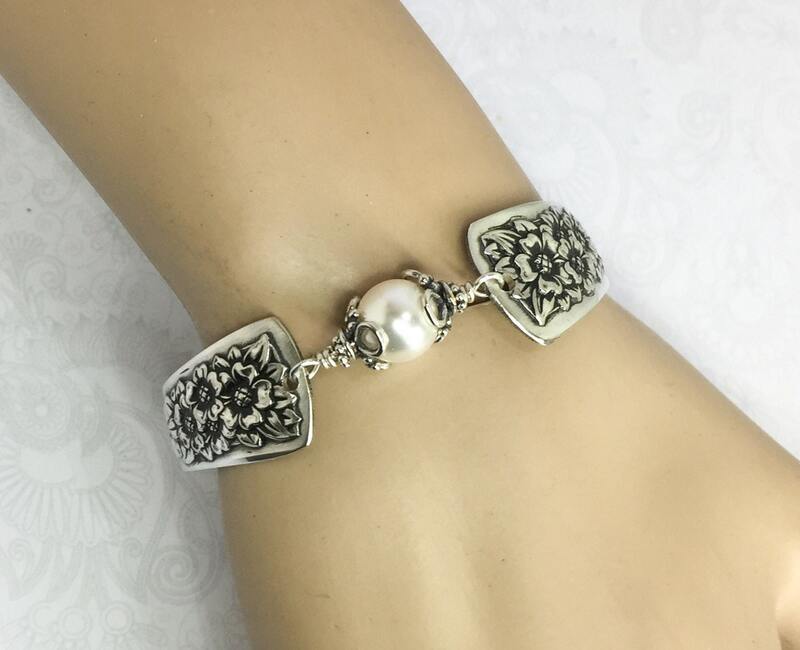 The bracelet is adorned with a 10mm white Swarovski crystal pearl, which is nestled within twists of sterling silver wire and dressed up with two filigree sterling silver Bali bead caps. 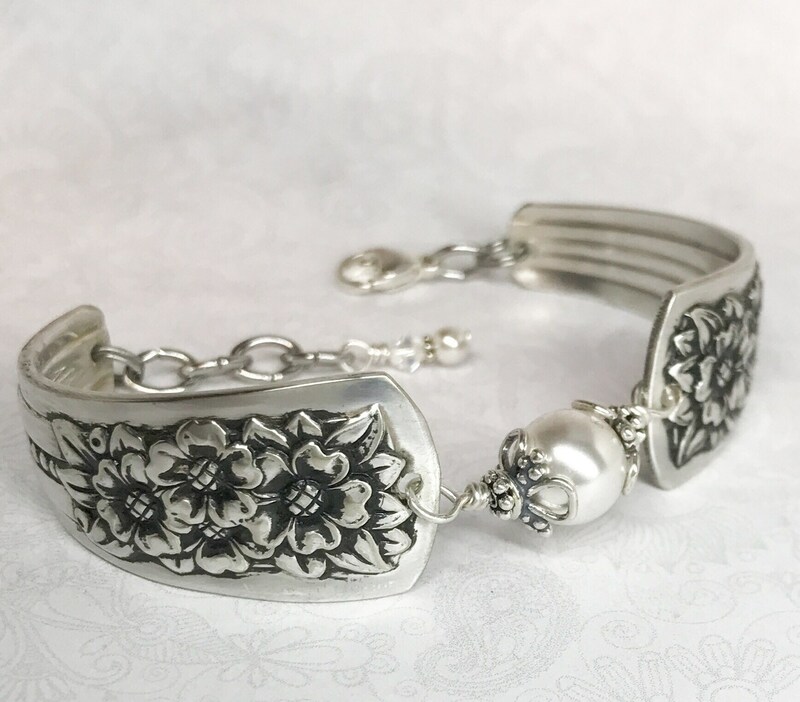 This spoon bracelet is finished with an Italian sterling silver lobster clasp for the ultimate security. There are also extra rings for an adjustable fit, and they're topped off with a smaller pearl and crystal at the end. Do you like this bracelet but wish for a different color crystal or pearl? 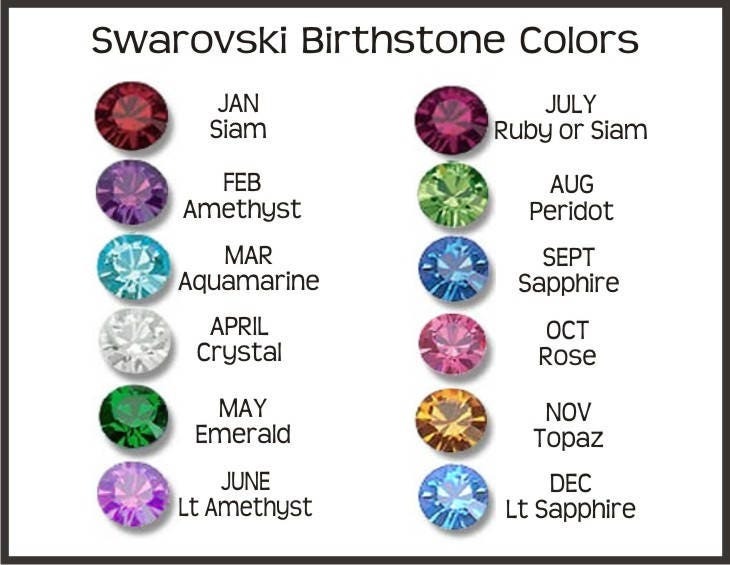 I carry all the Swarovski crystal birthstone colors & pearls. You'll be able to choose at checkout. If you like this bracelet just as it is, the first option is 'NO CHANGE'. 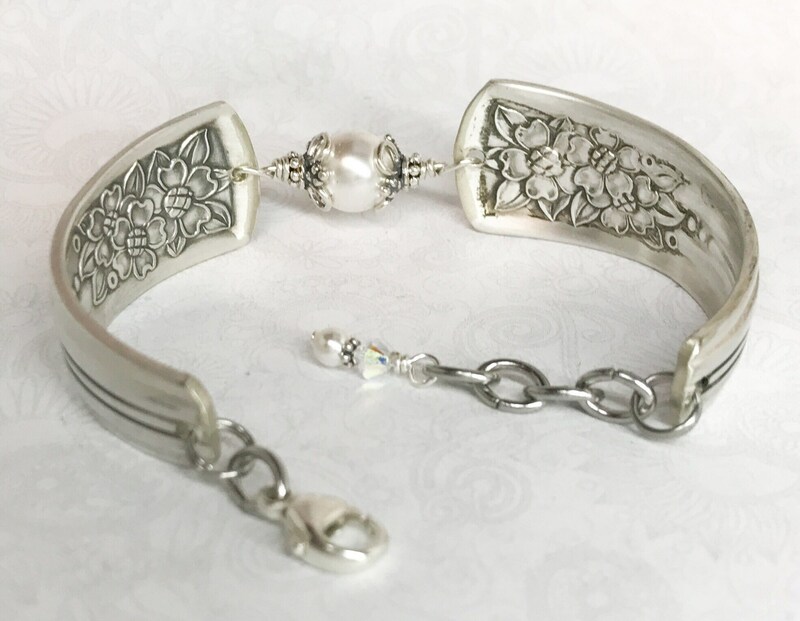 This festive piece of silverware jewelry comes to you in a special gift pouch; along with a Spoonfest Jewelry story card, and age & name of the spoons. 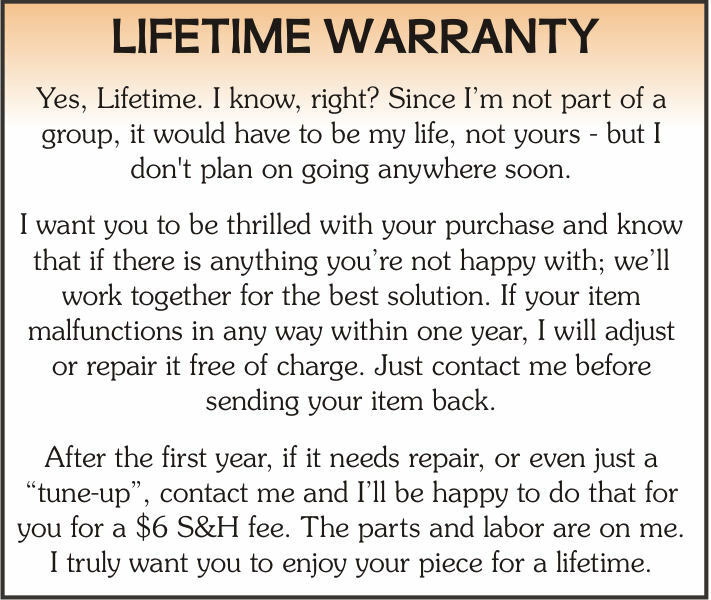 Plus, I made a special bonus for you. Tucked in your pouch will be a complimentary bracelet helper tool to make managing your lobster clasp easy. Beautiful bracelet. Still haven’t totally mastered getting it on my wrist with the hook sent along with the bracelet. I am extremely pleased with the order! Gayle Guidry. Absolutely beautiful workmanship. One of our favorite pieces of jewelry. 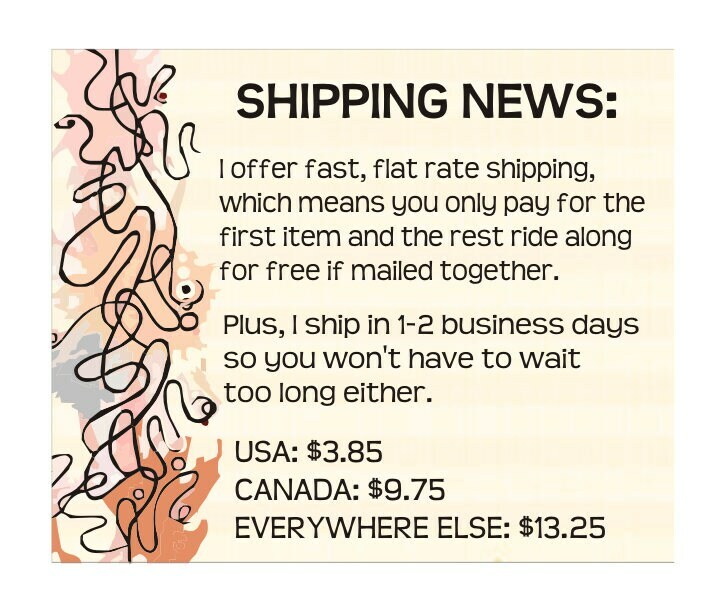 Easy to order, great selection and no problems ordering or shipping. Greatly recommended. Quality! Absolutely gorgeous and packaged lovely! Cannot wait to give them to my niece! !